Stereotactic radiosurgery (SRS) treatments in many cases involve a metal cranial frame that is attached to the patient’s skull. A custom moulded immobilization mask has several advantages over an invasive system, for both patient comfort and the treatment itself. 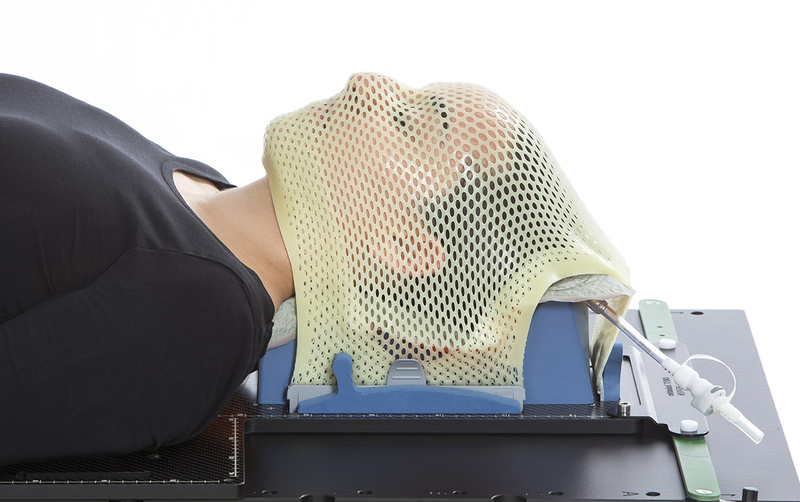 A frameless SRS approach is non-invasive and adds to the patient’s comfort: the patient can be treated without having a frame screwed on his or her skull. Furthermore, positioning images are no longer blocked or distorted by the metal frame and the workflow for multi-isocenter cases is improved. Orfit offers a small vacuum bag and a wide range of hybrid thermoplastic masks reinforced with a layer of Nanor. The vacuum bag easily moulds in the Orfit head supports and around the head and neck of the patient. The hybrid mask is moulded over the face. Compared to a single layer mask, a hybrid mask provides more stability, making it extremely suitable for SRS treatments. The Jessa Hospital in Hasselt, Belgium, has recently replaced its invasive stereotactic frame by hybrid masks from Orfit Industries. Research shows that the use of an Orfit Hybrid mask is just as precise as the use of an invasive frame to immobilize the head of a patient. Moreover, the use of a thermoplastic mask is painless, it is easy to reuse in case of recurrence and it increases patient throughput. Read our recent blogpost about this case here.